Meditating regularly is one of the most powerful and healing actions you can take for yourself and the world. Step 5 of Judgment Detox is devoted to this practice. The meditations in the book help you energetically clear your judgmental attachments and heal. Even a few minutes of meditation in the morning can recalibrate your mind and energy for the rest of the day. Meditation is the way we reconnect to the loving nature within us. In Judgment Detox I give you six meditations to practice each morning, six days in a row. Once you’ve practiced each one in order, you can practice them interchangeably or focus on the one that resonates with you most. It’s an amazing experience that will give you significant relief. Meditation has the capacity to transform all your relationships, including your relationship to yourself. When you tune in to the energy of love through your meditation practice, you invite an invisible force of love to take over. In the presence of that love the past can fade away and the energetic cords of judgment can dissolve. We all have energetic cords tying us to people all over the world. Sometimes we have cord connections to people we don’t even know. You might have a cord connection to a celebrity or to someone you met only once! When you have any kind of relationship with someone, your energy becomes connected, especially when a strong emotional event occurs between you. Energy cords can also be created when we make a contract or a promise. Even when that relationship ends, the energy cord can still be intact. This is particularly true in situations where you’re thinking negative, judgmental thoughts about that person. Your judgment creates a cord that ties you to them, whether you like it or not. Even when you think a relationship is over, you will still feel the pain and drama because those strong energetic ties can make you feel drained, tired and even upset. That’s why it can be so hard to stop thinking about an ex or stop obsessing over a business deal that went wrong. Physical separation is not always enough to end a negative connection. Often you need to clear it on a spiritual level in order to let go of the relationship and find closure. Not only does a negative connection make you feel crappy, it blocks your ability to attract what you want! When you have a cord attachment to someone you’ve judged, you’re stuck in a low-frequency relationship. That negativity lowers the vibration you put out. As a result you attract people and situations that match that low-level vibration. The great news is that you can heal your cord attachments through a simple meditation! This practice is so powerful for healing judgment. It allows you to let go and get closure from a past relationship. In this post I’m sharing one of my favorite guided meditations with you. It’s the first meditation in Step 5 of Judgment Detox. This is the Cord Cutting Meditation. It sends a clear message to the Universe that you’re ready to let go of judgment. You can practice this Cord Cutting Meditation to clear negative energy that ties you to anyone. It’s not only for past relationships. If you currently resent someone in your life, this meditation will help you release that feeling. You can do this meditation by following my guidance in the video below. This video is from my online course called The Judgment Detox. I recommend grabbing a notebook or journal so you can write about your experience afterward. When you are ready to meditate, simply press play, close your eyes and listen. When you’ve finished the meditation, pick up your notebook and begin to write about your experience. How did this meditation make you feel? Free-write in your journal for five minutes without editing or second-guessing yourself. Get more guided meditations to heal judgment and live a better life! If you like the experience of the video/audio guidance, check out my online course The Judgment Detox. This course magnifies every aspect of your Judgment Detox experience! It includes guided meditations, guided video EFT sessions and audio downloads for each prayer. In this online course I guide you through each step of your Judgment Detox practice in an immersive way, and I’ve included lots of brand-new and bonus material that isn’t in the book. Plus you can join a private Facebook community to find support and share your miracles! I think this came up at a moment I most needed it. I was able to see a glimpse of my ex partner’s innocence by the end of the meditation so I know it’s something I’ll continue to do to clear more of the negativity out. I looooved this meditation. It popped up on my email right when I needed it most. The best insight I got after journaling is not being afraid to let go, once you’ve surrendered the judgment. I’ve been holding onto that feeling right after you cut the chord, afraid to fully let go of the person, which has kept me connected, yet feeling ok. However, the cycle eventually returns. Thank you so much for this meditation today. I really hope there will be a book with mainly the technique’s from detox. This meditation and visialisation was nice to do. Love it. Thank you Gabby. This is a very powerful meditation. The free writing helped me release and send a person on their way in a kind way. I’ve been troubled by this friend being so sick in recent months, yet pushing through so he can sing with his choirs, if at all possible. He wants to drive me to my cataract surgery on Thursday, no matter how he is feeling. It is possible I’d be more comfortable with Jeff doing this. Jerry is my primary man friend, but I feel troubled by his strong commitment to Sunday ( a previous partner who still has free use of his 2nd bedroom, tho she does have to get his ok), even tho they barely are able to talk with one another, and she refuses to talk to me. Thank you, Gabby, for sharing your meditation insights. Your communication excellence and accompanying meditation video is highly effective in evoking the presence of mind and love that one needs when learning and establishing effective meditation skills. I am so very glad to see your path and circle of influence continue to grow! And to also benefit from the unique radiance that you bring to timeless truths! Thank you, Gabby, for sharing your meditation insights. Your communication excellence and accompanying meditation video are highly effective in evoking the presence of mind and love that one needs when learning and establishing effective meditation skills. I am so very glad to see your path and circle of influence continue to grow! And to also benefit from the unique radiance that you bring to timeless truths! Such a relief it was. Nice experience. I like it. So happy this has served you. I felt a sense of relief and closure. This person has been in my dreams at night way too often and I want her energy gone from my life. I saw her pixelate away as the cord was cut and light come into the world, as she faded into fog. Thanks Gabby. I needed that. Thanks Gabby for this profound meditation. I have read about cord-cutting before so I tried it. I feel better but still have a long way to go.Meditation is part of my daily life and really inspired me to share my experiences. . I have recently published my first book about my relationship with a passed celebrity in spirit so glad you mentioned those connections as well. Am looking forward to your next newsletter and video! I have The Universe Has Your Back but am loving your excerpts from Judgment Detox so thank you again! I saw very dark cord connected through stomach. After cutting, i felt that i have scope of growing a fresh cord of love and light with that same person. You can cut the negative energy cord and clear space for a healed relationship with them! Do you recommend doing this meditation daily if trying to get closure on a relationship ending? You can do this daily as a 40-day practice. 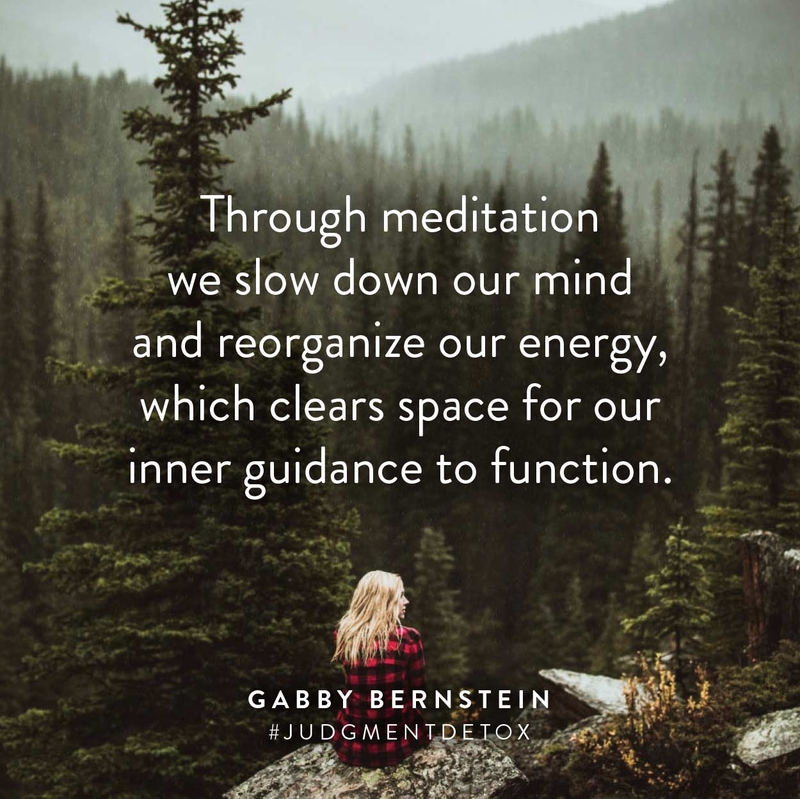 If you are practicing the Judgment Detox, follow the meditation practice in order before focusing on this one (or any other that resonates with you). I was not ready for what I just experienced with this meditaion. Immediately when you said “see him standing in front of you and a black cord attached – where is it attached, etc…” I began to cry! Letting go of this person has been the most horrific and excrutiatingly painful thing I’ve ever felt. Down to every cell of my body, every fiber of my being has been impacted and touched with the pain and awakened by his narcissistic ways. I am so ready to be free of him and this attachment to what I wanted so badly to become the fairy tail that i imagined it to be but became a nightmare instead. I didn’t want to feel these emotions again, but I’m going to let myself feel every last bit of it so I can finally move on in love and light. I sympathize with these fears and I encourage you to read my book The Universe Has Your Back so you can turn your fear into faith. I am confident the practices in this book will serve you in major ways right now. Wow…I saw a dark cord from my stomach to hers. When I went to cut it, I really didn’t want to do it. I followed your instructions, though, but felt like I cut off a vital part of myself and I wanted it back. I was surprised that I felt so emotional. Guess I’m still too deep in grieving? It can be very difficult to let go of a connection. We aren’t always ready to let go. Go easy on yourself and give yourself the time and space you need. I recommend practicing the steps of the Judgment Detox in order. By the time you get to this step you will likely be ready. Thank you for this. Very powerful. I cried instantly. I actually had a rope tied to two people whom I needed to finally cut off. I know one session may now eliminate the feelings in one sitting, but I know now just how much more easier it is to let go. The universe was definitely guiding me when this popped up in my email. Not being able to get rid of these thoughts about an ex, I have cycles of thought and signs regarding this person pop up everywhere. It can be overwhelming so much so that I have had my own inner voice say to me “he’ll come back to you if you let him go.” But here’s the thing, I haven’t fully let go and that is where I am grateful for this meditation. I want to heal… Something I am going to have to practice again in healing the cord. It is insane how strong cords can become even after knowing someone for a short period of time. Thank you Gabby for this and helping part of my healing. I am so proud of you for your willingness to heal. This takes real courage. Know that you are supported and held by the love of the Universe. This is only my second time meditating and I want to thank you for sharing that exercise. I felt an overwhelming amount of emotions after meditating with the cord cutting but also felt a sense of relief while I was writing .thank you and thank you April for sharing. Amazing. I’m so happy this has served you. Just finished May Cause Miricles and been working on my commitment to loving everyone and becoming more aware of my judgement. The cord cutting meditation brought me instant relief over an ex who brought up so much ego based fear “i am not enough” during the meditation i woke up light not personalizing his behaviors as a reflection of my worth but a reflection of his ego based fears keeping him blocked from the light of love in him. i love all that you do in brining so many people spiritual/energetic connection. i committed tonight to wake tomorrow and start the Judgement Detox. 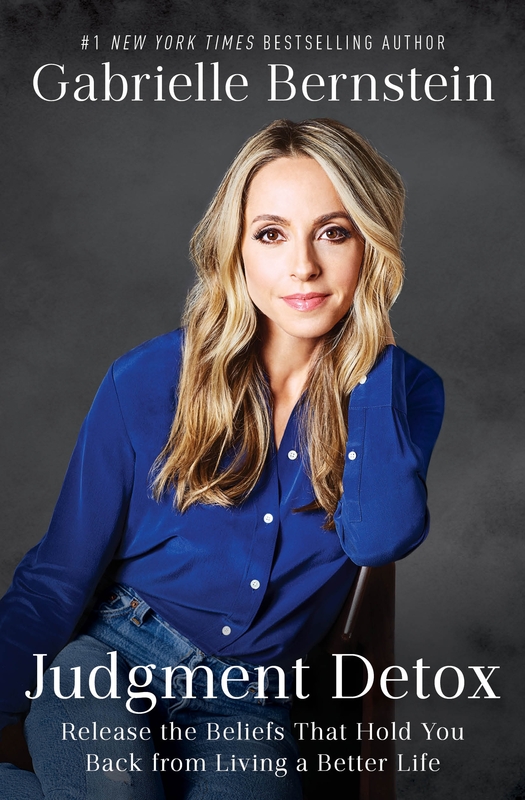 I am almost 10 years sober and have never felt more connected to my relationship with a “higher power” until your book crossed my path a year ago. What if this person is your boss that treats you poorly everyday? I still have to see her and work in a toxic environment. You can cut the negative energy cord and begin to heal the toxicity of that relationship. Tapping on your judgment can also bring you great relief. However, if you are working in a toxic place and are being treated badly by your boss, the healthiest and most empowering thing for you to do may be to leave that job. I understand it’s not always as easy as it sounds, but if you ask for guidance and take spiritually aligned action it very well may become clear to you that you need to leave that situation. You don’t have to quit immediately, but you can begin taking steps to leave that situation. For now you can also begin speaking up in compassionate but firm ways about what you need at work in order to do your job well and thrive. Get very clear about what you need and what you want and take action toward co-creating that reality, knowing the Universe has your back. I’m so happy to hear this meditation served you. If it resonates with you, you can make it a 40-day practice. Sending you love + light. Thank you for the meditation. It came at the right time. I did feel some strong emotions which I did not expect. Alittle concerning actually because I didn’t foresee the same to happen. Can you recommend your book that may help me to accept my ex’s decision and move forward? The Universe Has Your Back and May Cause Miracles will both serve you greatly at this time. I also recommend checking out this blog post for guidance on how to practice surrender. Love and light to you, my friend. Expect miracles. So grateful for this! The timing was perfect for me- I am working the steps and just finished step 4. This is such a blessing as a way to help clear some of those resentments and unhealthy connections..
Is that normal? That kind of saddens? It’s such a process and some days I don’t think it will ever be over. Thank you for your book Universe HasYour Back. I’m re reading and will start Judgement Detox soon. It is normal. Rest assured it is normal. You experienced an emotional release. Healing our judgment and letting go of relationships can be hard emotional work at times, but I want you to know without a doubt that you are supported. Let the tears flow when they come. You are supported. It will get easier. Sat Nam sister. Thank you so much for this meditation. It was both easy and devastatingly hard to envision them in front of me, knowing what was about to happen. I wasnt feeling anger or resentment, but instead profound grief and I had to literally swing that emotional sword in the air in order to cut the cord that I dont want, but need severed. I’m learning that in order to move forward, I have to cut those ties, even the ones I wish above all wishes to be repaired or that I could manifest them back into my life when we’re both healthier. The instant it was cut, and the floodgates opened, I was able to see their innocence, their sweetness, and even with the cord cut, they were still in my minds eye, and it didnt feel so much like a turning away or a goodbye, but rather an ‘i love you and respect you’ and wish you healing. Thank you so so much for your books, videos, and instruction. You have profoundly impacted my ability to heal. Grateful to witness your beautiful healing Dan. I just tried this, and I could envision the love of my life, who just ended our relationship, and I started crying. An immense sadness came over me. I met the love of my life after my divorce, but he decided that he didn’t want to be a stepdad. It has broken me. I never shed a tear when I was going through my divorce, and my love came to me unexpected one day, and we both fell madly in love with each other. He knew I had kids, and we tried to make it work. But he kept pulling away when it came time to engage more with my kids. I know this should be a done deal because my kids come first. I agree. But my heart is still broken to lose someone I deeply love. We had no other issues in our relationship. We got along great. I’m truly struggling with getting on without him. I’ve been listening to your books and talking to the Universe as you suggest. I just don’t know if it’s working. It’s important for me to get closure from any relationship that hasn’t worked out because I fall deeply in love, fast. It’s sad, but yes, absolutely, I believe everyone should receive closure in a relationship for sure.